Ty came from a family of four – he had an older brother, me and my husband. His grandparents from both sides lived close by and close friends and their children visited often. Ty was dearly loved by all. He spent most of his life in Cabarita Beach on the north coast of New South Wales. We moved here when he was four, specifically because it was a small village and we wanted our children to grow up in a safe and close knit community. Most people would describe Ty as sensitive, generous, compassionate, a little eccentric with a quirky sense of humour. He did struggle a little to make friends, but he was extremely loyal to those who took the time to get to know him. He played the piano and was an average to above average student in most subjects at school, with a real flare for Mathematics. He was also a thrill seeker and loved most sports. He was an accomplished basketball player and loved all codes of football. 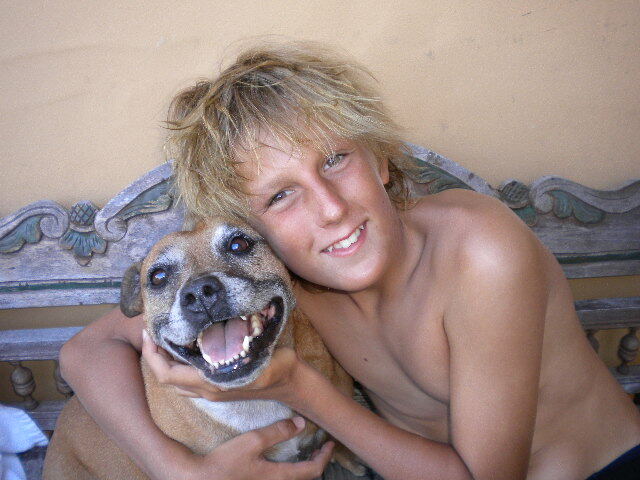 He was also a keen surfer and skateboarder, just like his brother who he adored. He was playing Rugby Union when he suffered a concussion that marked the beginning of some serious behavioural changes. All in all, Ty was a pretty normal teenager who came from a pretty normal family and there were no traumatic events or hardships that impacted on his life. I am not sure of the exact date, but I think it was early to mid April in 2012. Ty was playing Rugby Union for a local club. The team he was playing that day was at the top of the league and the players were much bigger and stronger than the boys in Ty’s team. They were not a rough team, but they were skilled footballers and fierce competitors. I know that Ty was wearing his head gear and shoulder pads that day because I always made sure of it – especially because most of the other teams were twice Ty’s size. It was about 3 or 4 minutes till the end of the game and Ty had the ball. He was knocked to the ground by a large player and looked like he was out cold. His coach called the First Aid Officer over and they were milling around Ty for several minutes. I wanted to race over there, but one of the father’s and a close friend of ours encouraged me to wait – he reassured me that if it was serious, they would come and let me know. Ty then stood up and continued to play for the last few minutes of the game. He was running up the field in position and seemed to be focused. At the end of the game, I asked him if he felt ok and he said he was fine. I asked if he was knocked out and he laughed and said no and ran off. He just wanted to go and hang out with the boys, so I let him go. There was no further mention of the incident by anyone after the game and so I guessed it wasn’t as bad as it looked, but I did keep a close eye on Ty that day just the same. About an hour after the game when we got home, he said he was tired and wanted to lie down. I was a little alarmed, because Ty was never tired during the day. I checked to see if his pupils were dilated but they seemed fairly normal (I had read somewhere in the past that these were two signs of concussion that should be monitored carefully). I had a friend and her son over at the time and I told them what had happened in the game. We encouraged Ty to sit with us and watch a movie. After the movie, he sparked up a little and seemed to have bounced back to his normal self, but late in the afternoon he said he was tired again and wanted to lay down because he had a headache. I was very concerned when he said this and so I took him straight up to the Tweed Heads After Hours Surgery. When the doctor examined Ty, he said that he had suffered a ‘pretty serious brain rattle’ and told me he should not play football for 6-8 weeks. I remember thinking to myself ‘Thank goodness, the season will almost be over by then!’. I never liked Ty playing football because although he was tall, he was thin and a little lanky and always came home with one injury or another – but he loved playing and was proud to be a part of the team. I asked the doctor if there was anything else I should do and he said I should just keep an eye on him and if I had any concerns over the coming days, I should take him to see his doctor. To be frank, I had no idea what to be concerned about other than the symptoms I mentioned above. When we drove home from the surgery, I asked Ty exactly what he remembered about the knock and what he said to me next is critical to his story. He said “All I remember is that big guy running into me and then I looked up and everyone was staring down at me”. I said to Ty, “But you got up and started playing again” and he said “I know, but I couldn’t see anything mum, I was just blank”. I watched Ty carefully for the next week or so and he seemed fine – physically. I recall him mentioning that he had a slight headache one day, but other than that he was happy to go to school, he played basketball the following Friday, he went surfing on the weekend and hung out with his friends. I stopped worrying, but I was insistent that we follow the doctor’s advice and said he was not playing football for at least 6 weeks. I talked to his coach, who seemed a little surprised but fully supported this decision. Ty and I agreed that he could go to the training sessions and join in with the fitness drills but there was to be no physical contact. I cannot remember exactly how long it was after the concussion, or ‘brain rattle’, that I started noticing some behavioural changes in Ty, but it was most certainly only a matter of weeks – at times he was irrational or reactive and occasionally he would just explode with emotion. It was noticeable because he was usually so calm and easy going. I didn’t pay too much attention to this because my husband had just recently been given a teaching post in in western Queensland, almost was five hours away. He had only finished his teaching degree a year before and there were no long term contracts close by. This was a difficult decision because we were a close family and we had never been apart from one another before. But our older son was in Year 12 and Ty had just started at a new school that year and so my husband and I decided it would be too disruptive for us all to move up there. My husband would come home every second weekend and we chatted on the phone regularly, but the boys and I missed him terribly. I rationalised that Ty was just acting out because he was missing his dad. One day at the end of April or early May, I came home from work in the afternoon and when I drove up the driveway, there was a rope with a noose hanging from the carport beam. When I went inside, Ty was sitting in his room and he said his brother had gone over to his girlfriend’s house. I was baffled as to why the rope was out there and I asked Ty what it was doing there but he just shrugged his shoulders and said “I don’t know”. He didn’t seem himself and I asked him if he was ok but he didn’t say much. I suddenly had a terrible feeling that something was terribly wrong and I panicked. Ty could see how worried I was. I had been worried because a local boy had committed suicide months earlier and Ty and his brother were quite rattled by the incident. It had taken a long time for them to recover from the shock of this, as it did with many other kids in our small community, and when I saw the rope, I couldn’t fathom who or why someone would do that. I was so scared and confused and all I could think to do was to jump in the car with Ty and bring his brother home so I could talk to them both and get some answers. Ty’s brother was just as confused as I was, but after we dropped him back at his girlfriend’s place, Ty said to me in the car “Mum, I have to tell you something. It was me”. I stopped the car so we could talk. I asked him why he did it and he said “I don’t know. I just felt really, really sad. I can’t even remember doing it, I just went blank and then I saw what I was doing and I ran inside. That’s when you came home”. I must point out here, that it was only last year when I started researching the link between concussion and mental health issues that I recalled Ty had used that very same word “blank” after he was concussed – I woke up in the middle of the night and I had what I guess you would call a flashback, where I recalled both conversations we had in the car. I remember the word so clearly, because it was such an unusual word to use – a word that Ty had never used before’. At the time though, I did not see any link at all, I didn’t realise he had used the same word, which is sad because if I had, things may have played out differently. I took Ty to see a psychologist at Tweed Heads Hospital soon after. I asked Ty if he wanted to talk to her alone before we went in, but he insisted I come in with him. We had only one consultation and she spent a long time asking him all sorts of questions. She called me soon after, the next day I think it was, and said that after a thorough assessment and after consulting with her colleague, she could not find any alarming signs or suicidal tendencies in Ty and mentioned that ‘copycat’ like behaviour is not uncommon after a suicide happens in a community. I was so relieved of course; I had been told what any mother wants to hear – that her child is ok. I reminded Ty how much we loved him and how important it was to let me or someone know if he was feeling down like that again and he promised he would. The erratic and unusual behaviour did continue though. There were mood swings, like sudden verbal outbursts of rage or emotional outpourings that seemed to have no trigger. These would never last for long and he would more often than not apologise afterwards. My husband and I recall me ringing him one night after Ty had an outburst on our way to his basketball game. I was upset because I could not work out where the anger was coming from and I said to my husband, “I don’t know what to do, it’s like he’s not even my son when he’s like that”. Not long after the concussion, Ty also started putting a towel or sometimes a sheet over the top of his white curtains in his bedroom to darken the room. When I asked him why he was doing this, he said that his room was too bright and that the light was hurting his eyes. I didn’t think much of this at the time either because his room was quite a light room. Another change that was becoming increasingly noticeable was his inability to do relatively simple school tasks that he had previously breezed through. For example, one night I was trying to help him with a fairly easy music history assignment – it was one of those assignments where the student is asked to give a brief biography and then some chronological details of their music accomplishments. Ty had never had any difficulty doing this kind of assignment but this time he was struggling to get anything down on paper. After a while, I sat with him and almost spoon fed him the information he needed, but he kept saying it was too hard. I got a little angry with him because I thought he was just being lazy, but then he screamed “You just don’t get it. I can’t do it anymore”. I could tell he was frustrated himself and visibly upset and I felt bad, but I was also very confused because it just didn’t make any sense. There were other moments like this, but this one stands out in my mind. My husband and I still believed that Ty’s behavioural changes were associated with him missing his dad. During the break before the final term at school, Ty had been getting involved in some risky behaviour – nothing too serious, but enough for us to be worried about where it could lead to if we didn’t step in. So we asked Ty if he would like to spend the last term up at the school where his dad was working. We said how great it would be for him to keep his dad company up there and he would even be in some of his dad’s classes. He really did seem to enjoy it up there, but my husband now recalls that the learning problems were happening there as well. For example, he recalls how he was baffled one evening because Ty could no longer do some of the simple maths that he had mastered long ago. My husband remembers thinking at the time how strange it was that he was struggling with simple maths when he had such an outstanding track record. We also found out after Ty’s suicide, that even though he appeared to be happy up with his dad, he was having some extreme mood swings. He had a girlfriend up north and her mother told us over the phone one day, after Ty had gone missing, that his behaviour with her daughter had been very erratic. One week he would be happy and friendly towards her and then the next he would hardly speak to her. The mother was very upset with Ty because of this. One day, soon after Ty and my husband moved back home at the end of the year and we were all under the one roof again, I gave Ty a hug in our lounge room. He looked down at me and out of nowhere he said, “Mum, I’m not the same person I used to be”. I thought this was his way of telling me how grown up he was now. He committed suicide a week later. Just before Ty went missing, we were all sitting on our lounge talking about what the boys wanted us to make them for Christmas lunch – my husband and I were about to go and do the big Christmas food shop and wanted to make sure we didn’t forget anything. Just as we were leaving, Ty said he might go for a surf. He walked out of the house with his board not long after we left and never came back. He was found hanging from a tree in the nearby bushland four days later. My husband and I had not once anticipated a link between Ty’s concussion and his suicide. We never even knew there was a possible link. About two years ago, I was watching a biopic on Michael Hutchence and there was a brief discussion by a doctor about the after effects of a serious knock to the head. I remember thinking back to Ty’s concussion and identifying some parallels, but at that time I was still coming to terms with his death and everything was still too raw, so I chose to discount what I’d heard. Last year however, I chanced upon a Ted Talk by Jane McGonigal: The game that can give you 10 extra years of life. Unexpectedly, she spoke very briefly about a head injury she had and the after effects on her mental health. For some reason her story became a trigger for me to want to learn more about the link between concussion and mental health. I read some research papers on the topic and then I started to look more closely at the time frame that Ty had experienced his concussion and the onset of the behavioural changes that had baffled my husband, my older son and me for so long. It was almost like putting the pieces of a puzzle together. At first I didn’t want to believe there was a link – I’m not sure why. For about 3 months I was having flashbacks of things Ty had said and done and when I carefully calculated the timing I could not deny that the link was not a coincidence. I waited for several months before I finally told my husband what I had learnt. He found this hard to digest at first because he was in Queensland when Ty had the concussion, but he remembers me telling him about it. My husband then too started having some flashbacks and started recalling unusual behaviour changes that are so apparent now, many of which we didn’t think to share with each other at the time because we just put it down to teenage behaviour and our disruptive living circumstances. One of our friends who was at the football game when Ty suffered the concussion also told me recently that Ty had had another concussion at a previous game that I did not go to, but he couldn’t remember exactly when. He said it was not as severe as the concussion in April 2012 but it was still a hard knock. 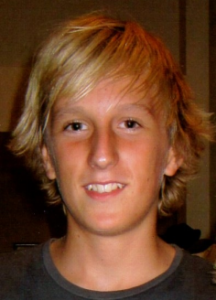 We understand it is difficult to substantiate the link between my son’s concussion and the behavioural changes that led to his suicide, but it seems impossible to discount this now that we have read so much about the connection between concussion and mental health problems. Learning about this does not make our loss any easier – in many ways it is much harder – but what we do know, is that the more aware people are of this, the more likely it is that others will not have to deal with what Ty had to deal with on his own simply because no one around him, including myself, saw some very clear signs of post-concussion syndrome. Things may have turned out very differently for our family if we had been aware of the behavioural symptoms associated with concussion, such as feelings of extreme sadness, sudden mood swings, erratic and impulsive behaviour, sensitivity to light, memory loss and the inability to do tasks that were once done effortlessly. We hope that by sharing our story, others may learn from our loss.